Cheap-Chic Decor: What is a Fleur-De-Lis? The fleur-de-lis is an accent often seen in decorating. What is a fleur-de-lis and why is it used in Tuscan decor? Wise Geek states that, “The fleur-de-lis, sometimes spelled fleur-de-lys, is an ancient symbol, although it has come to be closely associated with the nation of France. It consists of three spikes resembling the petals of a flower rising from a central crossbar, and it is clearly intended to represent an iris or lily.” According to Wikkipedia, “In French, fleur de lis literally means "lily flower".” The symbol is widely thought to be a stylized version of an iris or lily. It has been used by various civilizations for centuries. The fleur-de-lis has also been used on many flags and coats of arms. It is associated with the French monarchy and is also an emblem of the Itlalian city of Florence. The fleur-de-lis has been used decoratively on things from wall paper, to book bindings to ironwork. Today, the fleur-de-lis is a common decorative element in Tuscan decor. It can be found on everything from candleholders to plates, to designs on furniture and mirrors. 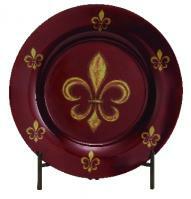 Items accented with a fleur-de-lis design are a simple way to bring a Tuscan feel to a space. Overall, the fleur-de-lis is a symbol that has been used for centuries. It is used in Tuscan decorating due to its ties in history to France and Italy. Bring a Tuscan feel to your space by using the fluer-de-lis as an accent. Visit www.cheapchicdecor.com to discover more ways to incorporate a fleur-de-lis design into your decor.